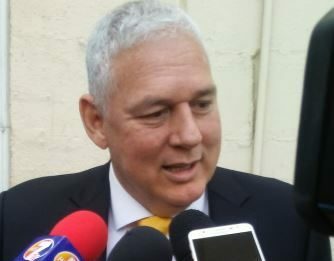 Prime Minister Allen Chastanet, responding to questions from reporters about the controversy surrounding Public Service Minister, Doctor Ubaldus Raymond, has declared that he must have all the facts. He said it was not having any impact on the budget presentation. In terms of the impact on Saint Lucia’s image, Chastanet expressed the view that it was still too early to make any predictions. “We don’t know what the facts are,” Chastanet explained. “As soon as we know what the facts are then people will be able to make a judgement,” the PM said in response to questions from reporters Thursday. He recalled having asked the media some questions Wednesday. “Until we’re can answer all these questions we’re not going to really be in a position. All we have is one side of a story at this point,” Chastanet said. “I am not here defending any actions, but before I make any pronouncements as to what we are going to do I must have all the facts,” the PM stated. He said Raymond is still a member of cabinet. “As you can see, he is not here. I have asked him to stay away – I’ve asked him not to go into office. I am hoping that I will have information very, very soon which again I will be able to make public, including a decision on how I am going to move forward,” Chastanet said. “I have to say to you that every single person deserves that – you have all the facts before you are able to make a story,” he observed. Chastanet recalled that Wikileaks Founder, Julian Assange, was arrested this week. “You saw the statements by the head of Facebook (Mark) Zuckerberg in terms of basically saying that social media is out of control; and many of us are finding ourselves receiving information and we don’t know what the source of that information is. We don’t know who edited it – we know nothing about it,” the PM stated. “So again, when information goes through traditional media sources, there is an assumption that you guys are doing your work and that you have answers to those questions,” Chastanet said. When it was pointed out that it was the second scandal involving Doctor Ubaldus Raymond, Chastanet repeated that he has to have all the facts. “At the end of the day, the Minister embarrassed himself and he embarrassed his family,” Chstanet said. “But at the end of the day, he who is without sin let him cast the first stone,” Chastanet declared. “I can tell you that we are close to getting information and very soon we will be able to make a revelation and a way forward on this issue,” he said. This time I am urging you to do the right thing. We are watching closely, this has gone on for too long, that not the images and examples we want for our youth. PLEASE SIR!!! Seriously Mr. PM you going to use “who is without sin”. Not everyone affected by this is sinner, because of how you’ll live don’t use that to measure other peoples lives. WHAT IS WRONG WITH THE “WITHOUT SIN” STATEMENT? UBALDUS HAS NOT COMMITTED A CRIME IF THAT WHOLE THING IS TRUE. WE HAVE THE TENDENCY OF WANTING TO CRUCIFY PEOPLE WHEN THEY ARE CAUGHT AND WE ARE DOING THINGS WORSE THAN THEM. I AM BY NO MEANS CONDONING MR UBALDUS’ ACTION IF HE IS GUILTY OF IT. HOWEVER THERE IS NOTHING WRONG WITH THE ‘WITHOUT SIN’ STATEMENT. THE MEDIA MADE NO BIG ISSUE ABOUT MR ISIDORE’S ISSUE. I KNOW THE COMPARISON WILL BE MADE BETWEEN A WELL KNOWN MEDIA PERSONAL AND A MINISTER OF GOVERNMENT. i MY VIEW THEY BOTH ARE VERY INTERESTING NEWS BUT ONE WAS KEPT QUIET UNTIL AND I WAS SO HAPPY THAT MR. ISIDORE ISSUE WAS NOT POLITICISED EVEN HIS ALLEGED ACTION, THE BOMB SCARE CALL, SEEMED POLITICAL. I GUESS ONLY BECAUSE HE APPEAR TO BE AN SLP SUPPORTED AND UWPs DO NOT LIKE RORO. Continue to apply the pressure to the PM we need answers this cannot sizzle out like the last time! One day someone is going to make that “who is without sin cast the first stone” statement and will be hit with a stone. Practice makes perfection, once is a mistake, twice is habitual, the man you see today is not the man you’ll see tomorrow is not on this Administration’s minds, but the man who crap out in the road never remember, but the man who step in that crap never forget the stench. Change can only come when we all get fed up and decide to do something about our situation. There is no excuse for any unethical or immoral behaviour in the government. However the leader of the opposition was the first one contacted by the honey trap from Trinidad for money for the tapes after Wayne refused to pay. The woman is a sociopath who snared a psychologically sick man. The leader of the opposition, not being a particularly bad or roroish man, passes it on to two of his SLP colleagues, one of them with many dirty infidelity misdeeds in his closet. Those MPs then passed it on to the unholy alliance of Richard and Christopher the Hunter. Ubaldus should go but all the others involved in this sordid matter should hang their heads in shame. It is said that politics is dirty, so true. Why all that crap and why all the energy and focus not on running the country properly. I not even concentrating on either of these parties because they all making me sick. Politics is never dirty. The people makes it detestable. Will Guy Joseph be investigated too? Mr PM we want to know. The PM investigate teefing GUY you mad he has too much on the PM. Then again thief don’t like to see thief with long bag. What a leader! This government is corrupt to the core. I’m floored by Castanets’s lame excuses to Dr. Raymond’s morally depraved acts is mind shattering. Every decent minded citizen should pour scorn on Chastanet. I’m now undoubtedly convinced that the leader cannot lead. The present administration is a one term government. This government is so morally reprehensible that it has lost its right to govern. What are you planning to investigate? If the Minister has admitted that this is voice are u happy to have such a naive almost reckless person in your Cabinet? Yes, none of us are without sin but in our society which is beset with so many social problems, when we condone such behavior from our leaders who should be setting the example, what are we asking of the youth? Mr. PM, we the non- affiliated voters will lose all respect for you ( and will not forget come elections day) if you don’t do the right thing and allow the Mr Raymond to go. Surely by now we have to acknowledge that we made a BIG MISTAKE electing this BUFFOON as our leader! What must this man do again? Spit in the faces of lucians? I am one who believes in giving people chances, even more than one sometimes. The problem seems to be habitual with this individual. Being a government minister should limit you to one chance since the example should start with the position. This individual should seek help. I do not have any issues if the government wants to help in his rehabilitation, but he needs to go before making that happen. I agree wholeheartedly with the PM’s response. As a society, we can be so hypocritical at times. We have all been guilty of bad-mouthing our colleagues, employees and employers, at one time or another or discussing business matters with outsiders. I am in no way condoning the Minister’s alleged second act of misconduct, but how exactly does or has this misconduct affected the bottomline? Did his behaviour deter tourists from visiting our shores? Has it hampered our economic growth? Did it exclude us from being the recipients of foreign investments or foreign aid? The answers to all of the aforementioned is a resounding NO. As the PM rightly stated, the man has embarrassed himself and his family. Perhaps he should be disciplined in keeping with progressive discipline protocols that govern the behaviour of regular employees who are found guilty of trangressing company policy. Although I am not sure which regulation has been violated. Can any one enlighten me? Or is it that the tenets of progressive discipline are not applicable to government ministers? We need to remove our emotions from the situation. The Minister has been asked to proceed on leave while the matter is investigated yet we are still dissatisfied. Where is your empathy and compassion Christian nation? ST, your sense ramblings deserve ridicule . Your argument is, as long as a Minister’s behavior does not affect the economic climate of the country, his behavior should be of little or no concern to anyone. So if a Minister expose himself to a group of impressionable school children, this is no problem because tourists still visiting, no jobs were lost and no one got physically hurt. Your thoughts are twisted like rope. You need a lot of help. It’s people like you who encourage immortality, lewdness and vile behavior. Y’all are a bunch of wolves waiting on a prey. There are more serious offences carried out in this country but you guys aren’t thirsty for justice. In what way Mr Ubaldus loose behaviour affecting our economy or preventing young people from getting jobs here. That’s what we’r should focus on. Our country needs. You are close to getting the information. Let’s see how long it will take. What ever questions you need the young lady to answer, I am sure Ubaldas can answer them. Lincoln, I agree with you wholeheartedly about giving a person second chances, but there comes a time when we have to use wisdom, God knows I am so not perfect, but this man suppose to lead by example, who are our kids local role models? This is no longer where we heaping coals of fire on ones head, this is throwing Pearl’s to swine. Where is his fellow Badventist and Seven Devils on this one? Oh yeah it’s only the Sabbath and what not to eat they are concern about, it’s time to sweep this one under the rug, I know what I’m talking about, well I am living it, I have a mother in law from Hadees for 28 years, who all of a sudden looking for the Ruth and Naomi treatment, who’ve treated me like a disposable from day one, but in the church before the doors open every week. Again the man you see today is not the man you’ll see tomorrow. Please Mr. PM get this man some help, I know that damage goods can still receive God’s love. But God cleaned them up, and used them. Oh how he must love me. That was very well written and so on point. The country is starting to down in hypocrisy. This is not new to anyone and I am sure if technology was there in the ice ages we would have more of that circulating. But please for God’s sake grow up, there is more to life than taking pictures of private parts. Statistics show that engaging in too much of these extra curricular activities take more life than abstaining. Yep like all the ones in here that supporting immoral behavior as something good by one of our leaders because they are worst things out there. Wow!!! Bravo!!! Le them find some facts. was it a real tape or not. Look someone said he resigned and that was false. Let a proper investigation be done before a conclusion is taken. We all know he is being targeted which is clearly reason for doubt. We lucians need to stop this….don’t care whether you yellow or red….wrong is wrong and there is no excuse for it…..no one needs to cast the first stone…the minister took an oath and that means he has to rise above the bar…he can’t continue to behave in such a manner…he is now a public figure and should not shame us like this…Not only his family but the country…his family will deal with him but he is also accountable to us st.lucians….he cross the line when he called us lazy….yes lazy….We having a convo with your side chick that’s not a problem but it becomes one when he involves government affairs…So please stop all them nonsense trying to paint him good and if no one without sin cast the first stone….he was given a chance and falter again….So he is now a sinner…. The fact is Mr PM, you and cohorts entrapped the man. Don’t deny it!